Sail Stadefrance have pulled out of a lease to take over Cape Town's Green Point Stadium from November this year. (CNN) -- A company due to take over the management of one of the venues used in the 2010 World Cup in South Africa has pulled out of the deal after miscalculating the running costs. The Sail Stadefrance Operating Company (SSOC) -- a partnership between South African events company Sail and French consortium Stadefrance -- were due to take up a 30-year lease on Cape Town's Green Point Stadium on November 1 this year. But Cape Town's residents could now end up paying for the $600 million stadium -- as the management of the venue transfers to the city in January 2011. SSOC chairman Morne du Plessis said that the company had incorrectly anticipated the amount it would take to run and maintain the stadium, estimated at around $6 million per year. "In the light of unresolved matters that affected the viability of the lease we have advised the city that SSOC would not be in a position to enter the lease," du Plessis told the official website of the city of Cape Town. "Shareholders were not prepared to enter the lease under circumstances that projected substantial losses." The SSOC had been managing the stadium on behalf of the city since January 2009, apart from during the World Cup when the tournaments' organizing committee were in charge. Eight World Cup matches were held at the 68,000-seat Green Point, one of five new stadiums built for the World Cup this summer. Tournament CEO Danny Jordaan promised South Africans that the new facilities would not become "white elephants" and would leave a legacy for generations to come. "To ensure a lasting legacy and the commercial viability of the stadiums, they will be used for both rugby and soccer," Jordaan said before the World Cup. "This country has also used sports stadiums for major political rallies, concerts and church events. They can, therefore, also be used for outside of sport," he added. 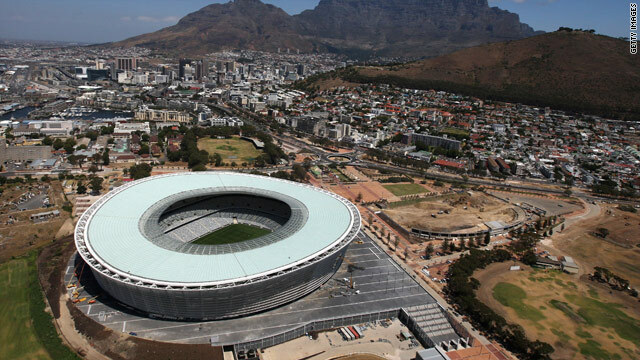 And despite the setbacks with the future of the Cape Town stadium as well as the burden it may place on the city's taxpayers, acting executive mayor of the city Alderman Ian Neilson has assured residents that future events will take place there as planned. This includes national football team Bafana Bafana's upcoming match against the U.S. on November 17. "While the current management deal has now fallen through, we also see new opportunities and will now engage directly with the relevant sporting codes in the City on how we jointly take forward the future of the Cape Town Stadium," Neilson told the city's official website.